» Connect to the World from Any Cell Phone! Low Cost International Calling from Any Cell Phone! 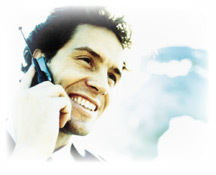 Access PrepaidOnline.com's great calling card rates on international calls from your mobile phone. Mobile2Global acts as a separate add-on service to your existing wireless plan by providing international calls at even lower rates than your cellular plan provider. Since it works as a separate service from your existing wireless plan - there are NO phone numbers to change, NO contracts to sign, and NO long-term commitments! Do you have limited access to international calling from your mobile phone? Are you tired of paying high rates for international calls from your mobile phone? Make your cell phone a PrepaidOnline.com PINpass number, and you'll never have to enter a PIN to place PrepaidOnline.com calls. PrepaidOnline.com calling cards give you one simple toll free access number you can add to your cell phone Contact List or Directory and speed dial your way to big savings. Take advantage of your mobile carrier's unlimited nights and weekend minutes to save even more. Once you sign up for Mobile2Global, simply place a call to the Mobile2Global U.S. access number, and your cell phone is automatically recognized. From there, you are free to dial any phone number in the world, at up to 75% savings. There are no calling card numbers or PINs to remember. It's that easy! All Mobile2Global minutes are "anytime" minutes - which means you'll experience the same low international calling rates 24 hours a day, 7 days a week. With rates as low as 4.4 cents per minute, there's no more "strategizing" over how or when to call internationally from your mobile phone. To SIGN UP NOW for Mobile2Global , select denomination from the box on the right and click buy!